The issue of faculty development reclaimed the top spot. Academic transformation, previously a consistent top-three finisher, took a tumble in 2019 down to 10th. After falling to 16th last year, the issue of competency-based education and new methods of learning assessment jumped up to 6th for 2019. 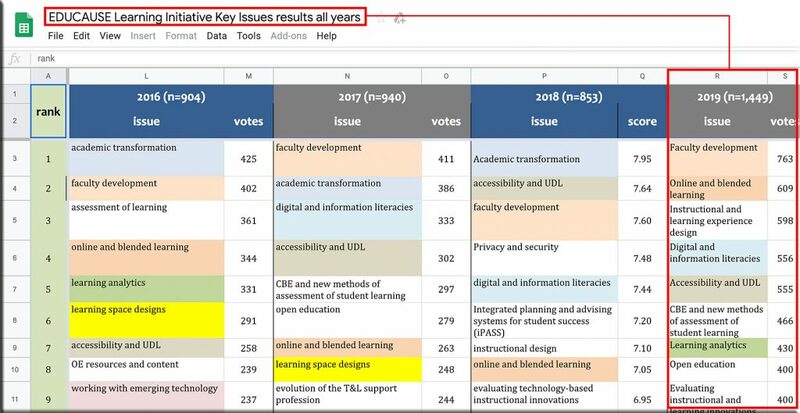 The issues of accessibility and universal design for learning (UDL) and of digital and information literacy held more or less steady. Online and blended learning has rebounded significantly.